Response card: Mulberry soft white cardstock. Response envelope: Milkweed A2 size (4-3/8x5-3/4) Envelope lining inserts of light green mulberry (you glue in the liner). A strikingly lovely Invitation for a Green, Seaside or Garden Wedding party. DIY Invitation with pressed sprig - tree free& post-consumer recycled papers. PAPER FACTS: Mulberry papers are made from fibers gathered from mulberry bushes, a renewable source. The envelopes are 100% post consumer recycled paper made in the USA or Canada. We score the wrappers here in Pasadena, CA. Organic landscape invitation wrapped in a heavy mulberry paper wrapper with one deckled edge. Invitation is printed on matching mulberry card, mounted on recycled cardstock for extra weight. creating an invitation that is sturdy in the hand. RSVP enclosures and map neatly tuck inside. Closes with a beautiful sprig of Euphorbia marginata. Envelope: Milkweed 100% post consumer 70 lb. A7 envelope (very handsome) with light green mulberry envelope liner (assembly required). Colors: Complex soft white (ivory overtones) papers and spring greens. Invitation Card:Natural heavy weight mulberry. Wrapper:Natural heavyweight mulberry with one deckled edge. 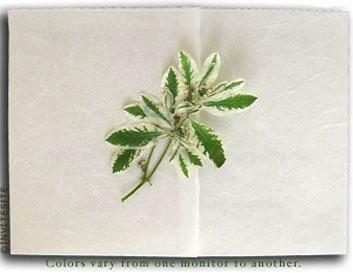 Pressed Flower:sprig of Euphorbia marginata. Envelope:Natural 100% post consumer recycled opaque A7 envelope. Extra DIY paper:Printing templates in MicroSoft Word if you plan to print these yourself.